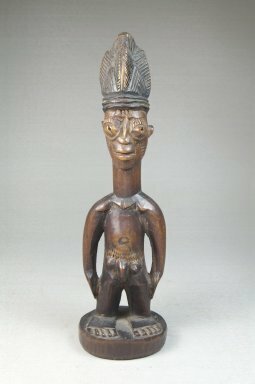 Carved wood male twin figure with elaborate, conical shape coiffure. Protruding eyes, facial scarification markings, pierced ears. Arms at sides, feet flat on disk base. Male genitalia, navel, pointed buttocks. Condition: Fair, mellow patina. Crack down back of figure and through base.